I made some sweet barbecue ribs not long time ago. It was so delicious that I can’t stop myself from eating. This recipe is very easy, the meat is tender and falls right off the bone, so if you’re hungry for real meat then grab your pen and notebook and writes the recipe down. I used to add ginger ale or sprite (to soak meat) but not this time. These liquids are good meat tenderizer. 1. Place the ribs in the baking dish (9x13 inch). 2. Add water, soy sauce, Worcester sauce, hickory liquid smoke, garlic powder, onion powder, pepper and salt to taste. 3. Cover with aluminum foil. 4. Bake in pre-hated oven 250 degrees F for about 2 to 3 hours or until tender. 5. In a bowl, mix barbecue sauce, catsup, Worcester sauce, hickory liquid smoke, and sugar. 6. Preheat the grill for medium heat. 7. 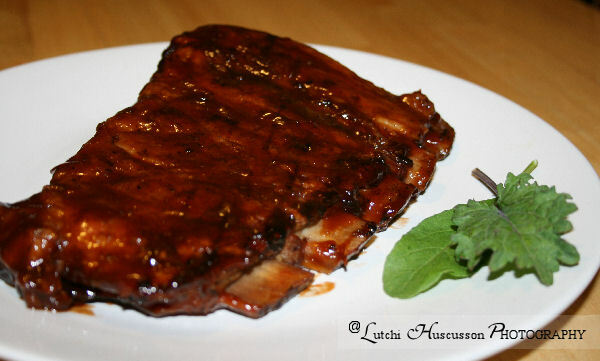 Place baked ribs on grill; cook its side for 3 to 5 minutes, basting with barbecue sauce. 2 Comments On "Sweet Barbecue Pork Ribs"
I love it when it is sweet and grilled to perfection! I miss my mother's barbecue! She likes it sweet, too! The photo is like speaking that the barbecue is delicious! I can't wait to try this one.